¡SOY AGUS PIANOLA! MI VIDA ERA NORMAL HASTA QUE CONOCÍ AL SR. FLAT Y A SU PANDA DE MONSTRUOS. ¿QUIÉN ME IBA A DECIR QUE VIVIRÍAN TANTAS AVENTURAS INCREÍBLES? PARTE DEL MÉRITO ES TAMBIÉN DEL MALVADO DR. BROT Y EL TARUGO DE SU AYUDANTE NAP, QUE SE INVENTAN LO QUE SEA PARA AMARGARNOS LA EXISTENCIA. 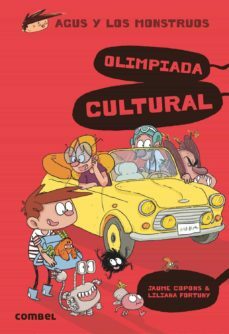 LA ÚLTIMA, QUE NOS HEMOS CLASIFICADO PARA PARTICIPAR EN NOMBRE DE LA ESCUELA GALERNENSE EN UNA OLIMPIADA CULTURAL. ¡NOSOTROS, UNAS LUMBRERAS! ¿OS LO PODÉIS CREER? ¡YO NO!